Road traffic activity has become one of the greatest sources for airborne particulate matter (PM) in many urban landfill areas. MERI laboratory will monitor these PM parameters to determine attainment status for areas in Meadowlands district to the federal and state ambient air quality standards. Adverse health effects from breathing air with a high PM2.5/ PM10concentration include: premature death, increased respiratory symptoms and disease, chronic bronchitis, and decreased lung function particularly for individuals with asthma. The EPA has promulgated health-based standards for the concentration of PM2.5 and PM10 in the atmosphere. The National Ambient Air Quality Standards (NAAQS) for the 24-hour average have been set at 35 and 150µg/m3, respectively (https://www.epa.gov/air/criteria.html). The NJMC complex is in close proximity to many anthropogenic inputs including well-traveled highways, air pollution from NYC and particulate matter from landfills. The object of this project is to provide local air quality monitoring data to ensure health index are met and to contribute to EPA’s strategic objective to reduce the risks from toxic air pollutants. The sampling will follow the US EPA 2013 monitoring schedule (https://www.epa.gov/ttnamti1/files/ambient/pm25/calendar_2013.pdf) with a Twelve-Day sampling period for ambient air monitoring. Both PM2.5 and PM10 masses are collected on the NJMC building roof using a Partisol FRM 2000 low volume sampler (16.7L/min) and a small (47 mm) Teflon filter. The masses of particulate matter are measured by a microbalance in an EPA certified weighing room (EOHSI, Piscataway, NJ). The filters are digested and the samples are submitted for elemental analysis by ICP-MS. This analysis determines the concentration of 21different trace metals. 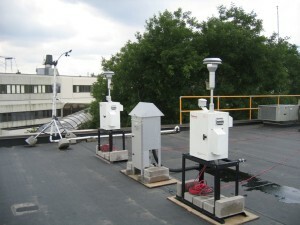 .A vast range of meteorological parameters and ozone data are also collected continuously at the same location throughout the year by onsite meteorological instrument (Davis, CA) and gas analyzers (Thermo 49i).